Is it really as glamorous as you imagine backstage or is it just another day at the office for the acts on the Oxegen bill? RTÉ.ie asked them to share some of their favourite backstage festival stories and here are the answers we got. I accosted Bootsy Collins once. I grabbed him and put him in a headlock and went "Bootsy, Bootsy, your music will outlast religion" and then he just looks and me and goes "Man, that's amazing" and then he called his friends over and said "Say it again, say it again" and I had to say it again. It was good. I was just really excited. MC Double D (Daimon Downey), Sneaky Sound System. We had to ask Lily Allen to leave us alone. (Benjamin) Yeah, she kept stalking us. (Deco) Benjamin and Deco from Republic of Loose. Read more festival interviews here. Jason Mraz's album 'We Sing. We Dance. We Steal Things.' is out now. Carolina Liar's album 'Coming To Terms' is released on 18 September. Sneaky Sound System's next single I Will Be Here' will be released on 28 August. Read our Oxegen Festival blogs here. 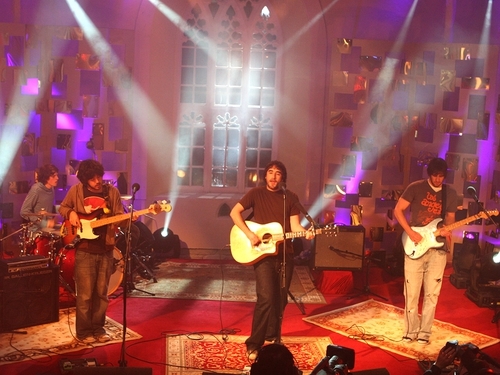 Check out RTÉ 2fm's festival coverage (including live sets and interviews) here.